Gary Wilson made his highest score in the County Championship for 14 months as Derbyshire fought back against Northamptonshire on the opening day of the Division Two match at Chesterfield. Wilson made 66 after Harvey Hosein with 58 started a recovery that lifted Derbyshire to 250 after Ben Sanderson had blown away the top order to finish with 5 for 53 from 20 overs. Tony Palladino then took two wickets as Northants slipped to 74 for 3 on a day to remember for Derbyshire’s cricket and commercial operations manager Dan Wheeldon who marked his debut at the age of 29 with an unbeaten 33. 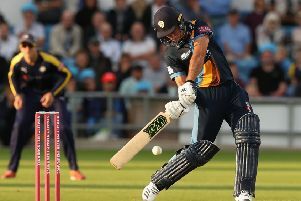 Billy Godleman was caught behind pushing at one that kept low and when Alex Hughes played on to Nathan Buck, Northants would have fancied their chances of denying Derbyshire a single batting point. But Chesterfield-born Harvey Hosein was composed from the start and with Matt Critchley, added 58 but Northants broke through in the first over after lunch when Critchley was lbw playing across the line to Nathan Buck. Wilson drove Seekkuge into the pavilion while Wheeldon made the most of a reprieve on five when Richard Levi spilled a low chance at second slip to play with impressive judgement in his first innings. When Wilson was bowled by Buck, Wheeldon opened up and drove Sanderson for two fours before launching Prasanna into the crowd over long off as Derbyshire achieved the bonus of a second point. Wheeldon’s impact with the ball was more low key as his opening three over spell cost 15 and Luke Proctor and Ben Duckett cruised along at five an over until Palladino struck twice in three balls. Duckett was caught behind trying to cut a ball that was too close to him and after Vasconcelos was beaten by a good length ball, Proctor inexplicably left a straight ball from Viljoen as Northants closed 186 behind.